Over the past year and a half, much attention has been given the federal government’s commitment to prioritizing prosecution of food companies that engage in criminal behavior. In some instances, this has been used as a scare tactic, shining a spotlight on the executive responsibility of company executives. Although focusing on executive liability isn’t necessarily a bad thing, Stephen Ostroff, M.D., deputy commissioner for foods and veterinary medicine at FDA, wants food manufacturers to know that FDA isn’t out to get them. 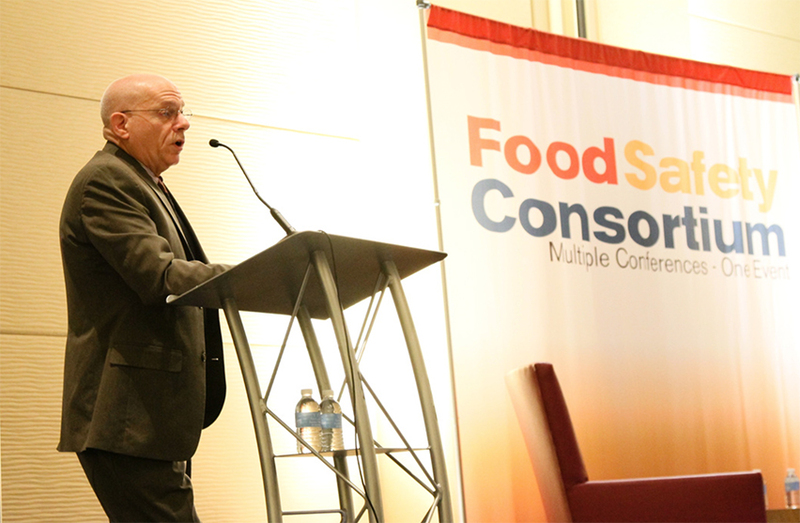 During yesterday’s opening keynote presentation at the 2016 Food Safety Consortium, Ostroff commented on FDA’s approach to enforcement. “I often have to scratch my head as why this has been such a tremendous concern in a regulated industry…sitting at FDA, we have not had any change in our thinking and approach about liability,” said Ostroff. “FDA pursues legal action against companies that are clearly negligent and clearly violating the law.” He emphasized that FDA’s goal moving into the FSMA compliance phase hasn’t changed; it’s about implementing a food safety system focused on preventive controls. The deputy commissioner also commented on the agency’s progress since FSMA’s seven rules were finalized in May, pointing out that these rules are foundational, and additional rules are to come. These rules will address lab accreditation, traceability related to imported products and a reportable food registry tool. “If when we visit we identify very significant food safety hazards that we think pose an imminent risk of foodborne illness, we will have to take action.” – Stephen Ostroff, M.D. Initial compliance date for FSMA Preventive Controls Rule (for large companies). FDA wants to be a partner in assisting companies with the preventive controls requirements. “That for us will require a lot of work on the part of those who are going to be conducting these inspections, but our goal is to help you and tell you in which areas you’re doing quite well and in which areas you can do better,” said Ostroff, adding that many of the aspects of the preventive controls rule are very similar to what many companies have already done. Foodborne outbreaks. With several outbreaks in the 2015–2016 timeframe (ice cream–Listeriosis; cilantro–cyclospora; cucumbers­–Salmonellosis; Mexican-style fast food–E.coli O26; flour–E.coli O121), the Inspector General expressed concern over the FDA recall process and criticized the agency for not having better defined timeframes. In response to that report, FDA implemented the SCORE (Strategic Coordinated Outbreak Response and Evaluation) team, which guides concrete action plans for measures that the agency must take in the areas of recalls, for example. The team consists of decision makers from key operations and enforcement offices with a goal of expediting the evaluation of compliance and enforcement options. Since April, SCORE has addressed flour contaminated with peanut protein, facilities contaminated with Listeria, Salmonella in pistachios, and baby food that was not manufactured in compliance with infant formula regulations. Antimicrobial resistance. The issue is “getting attention at the highest levels of government,” said Ostroff, adding that the best way to address antimicrobial resistance is to not have to treat it in the first place—and to do this is through reducing the incidence foodborne illness. The agency is moving forward in several areas here, including addressing non-judicial use of food animals and veterinary settings; enhancing NARMS data and isolate collection; and collecting data on antimicrobial sales by species. 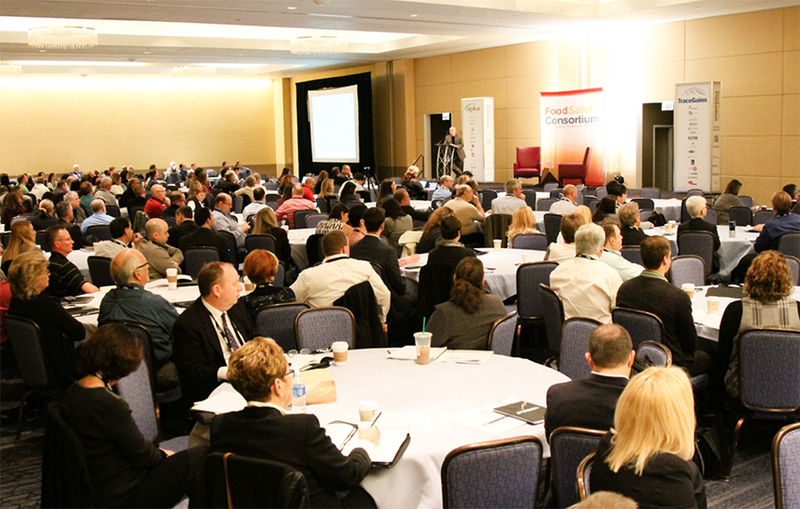 Attendees listen to Stephen Ostroff, M.D., deputy commissioner for foods and veterinary medicine at FDA, give the keynote presentation at the 2016 Food Safety Consortium. Applications are due August 3.